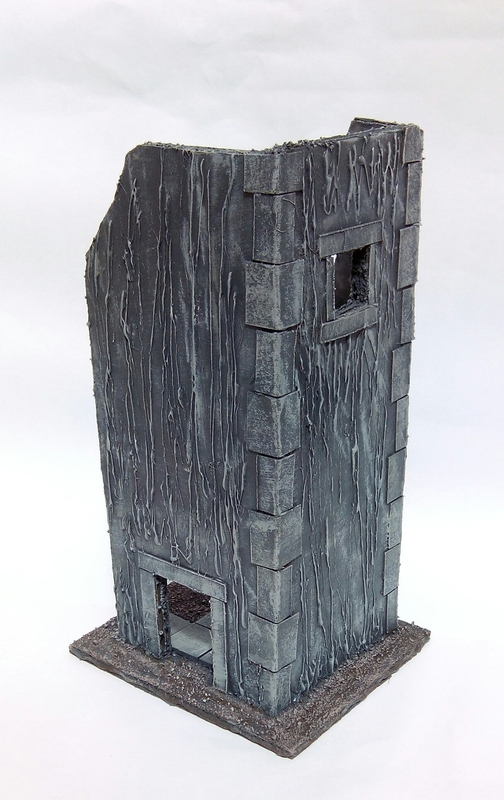 I originally had plans to make my Frostgrave scenery a mix of both complete and ruined buildings. In the end I decided against this and concentrated on ruins. The main reason I changed my mind is time. 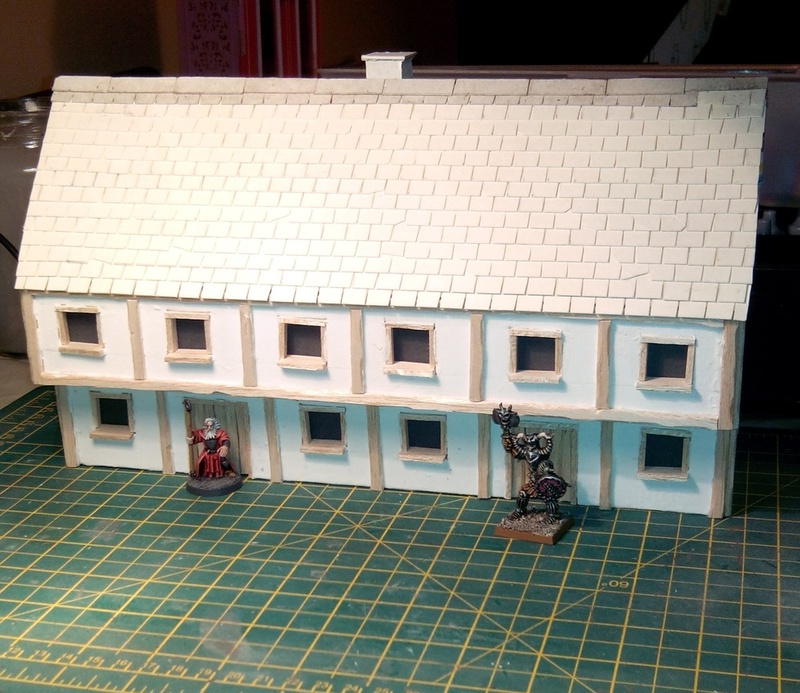 Late last year I started making a terrace of Tudor style town houses using the early 90s GW techniques with foam card, balsa and filler – an upgraded full size tiled roof version of the Peasant Hovel I made a while back. 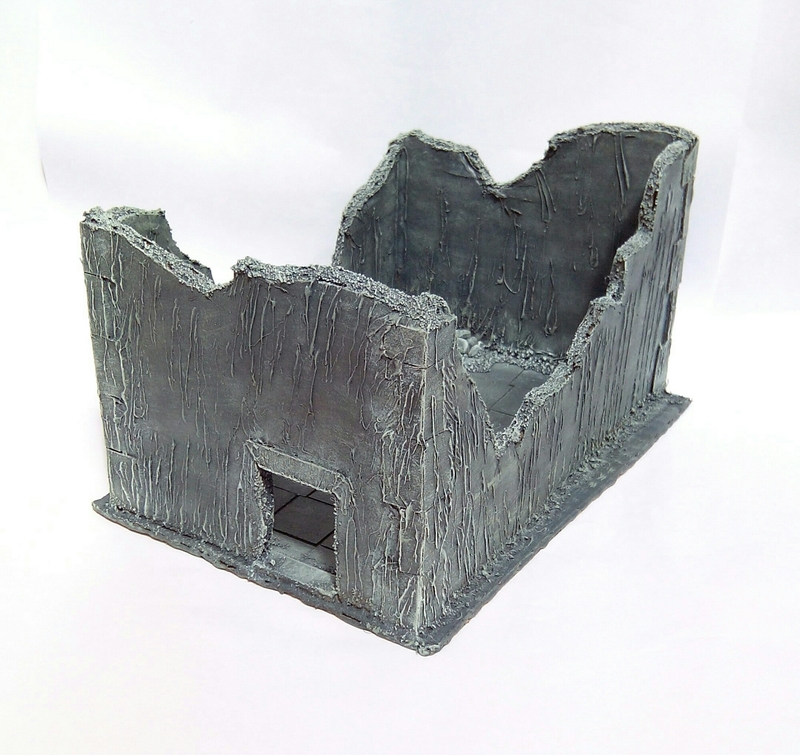 Scratch built Medieval style town houses – minus chimney pots! This took over a week of sessions to produce and will probably take just as long to paint – it’s stored away until I get the mojo to actually paint it! I know it’ll be splendid when it’s completed but at that sort of rate I’d never finish anything so my plans needed an overhaul. The second reason for making ruins is my gaming companions. 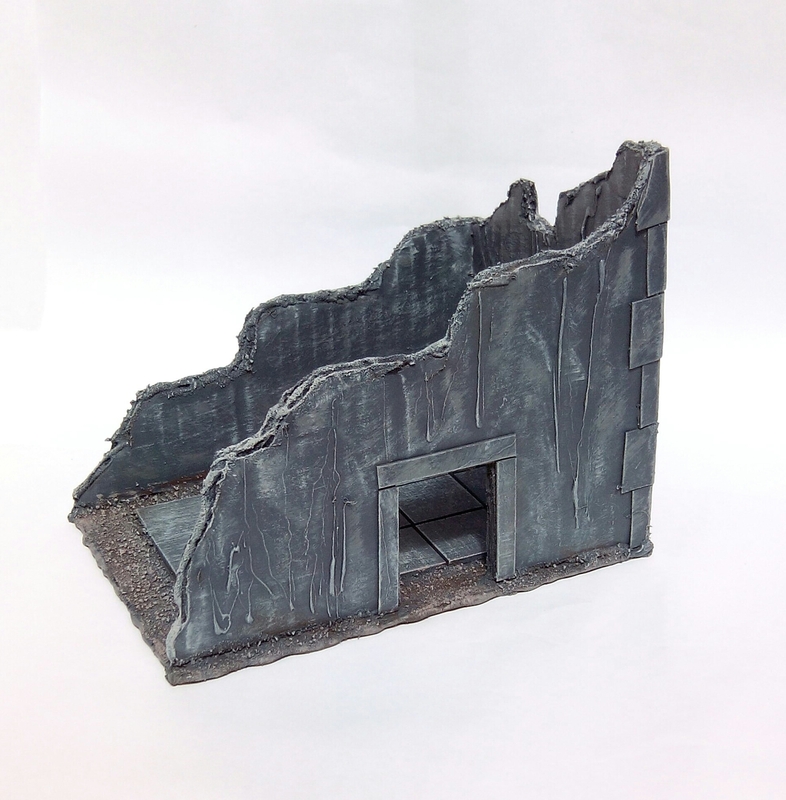 I know full well that if I add complete buildings onto the table for a skirmish game the first thing they will want to do is get their characters inside buildings to hide and snipe from the windows! 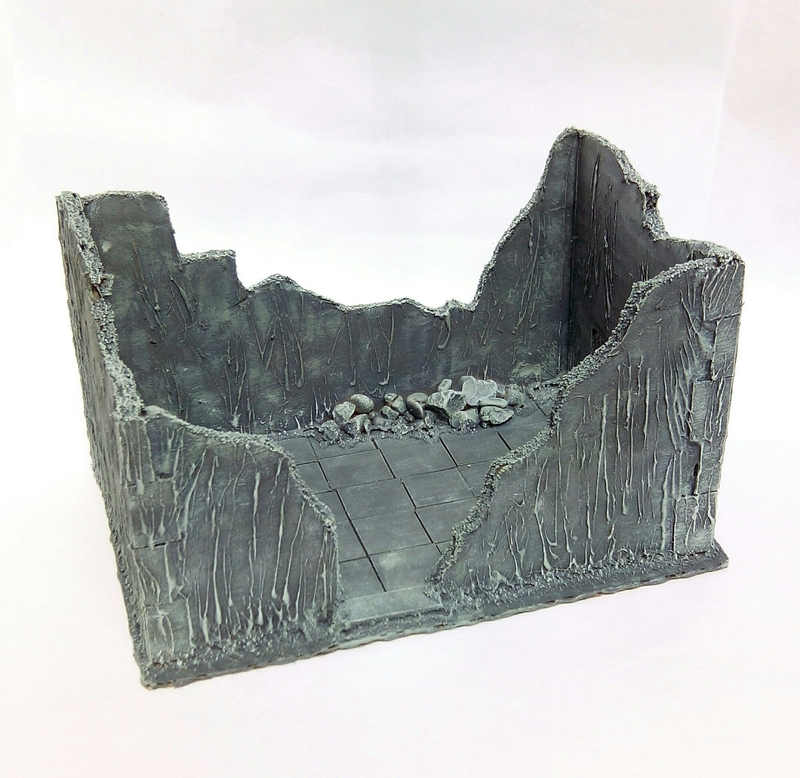 With no desire to draw additional floorplans or increase the complexity of model building so they can be accessed by miniatures I’m just sticking to ruins that are accessible without lift off floors and roofs etc. I’ve briefly mentioned before about the polystyrene ceiling tile ruins that my old gaming companion ‘L’ and myself built back in the mid 80s. These were based on WW2 scenery he’d seen at a Wargaming Show and we used them for skirmish games of WFB 1st and 2nd Edition. I realised these would be perfect for Frostgrave and decided to look into them again. Now it appears the world has moved on considerably since the mid 80s with regards to polystyrene tiles. It seems people no longer wish to add the (presumably aesthetic) illusion of paved panels to their ceilings anymore. Also it seems they no longer want to dramatically increase the flammability of their properties. This means the cheap polystyrene ceiling tiles that we used then are no longer available. I needed to re-think the whole idea but to be fair the ruins we created back then were very fragile and wouldn’t store or travel well anyway. The idea was great but the execution needed an update. 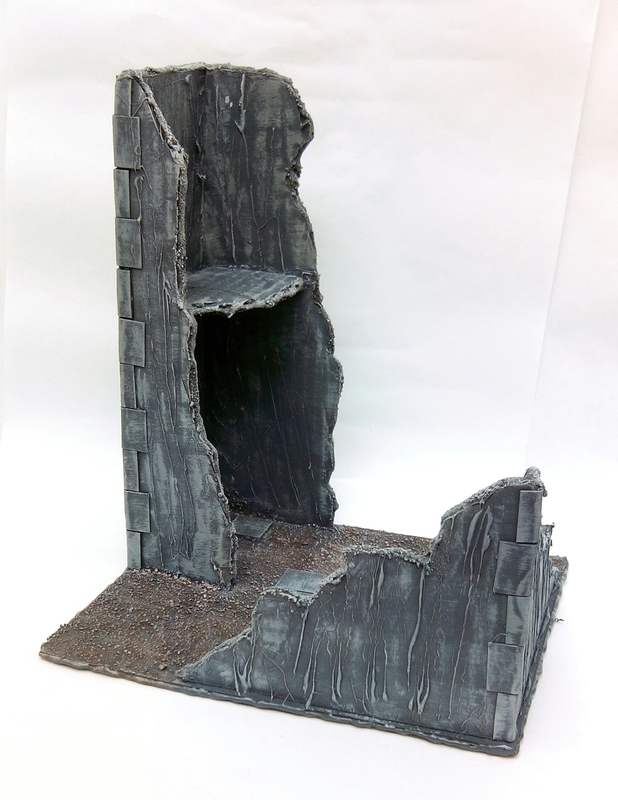 Looking for inspiration there are plenty of youtube ‘how to’ videos and wargaming magazine articles about using hot glue guns and modern household materials for scenery building. I already own a glue gun so I decided to give it a go. 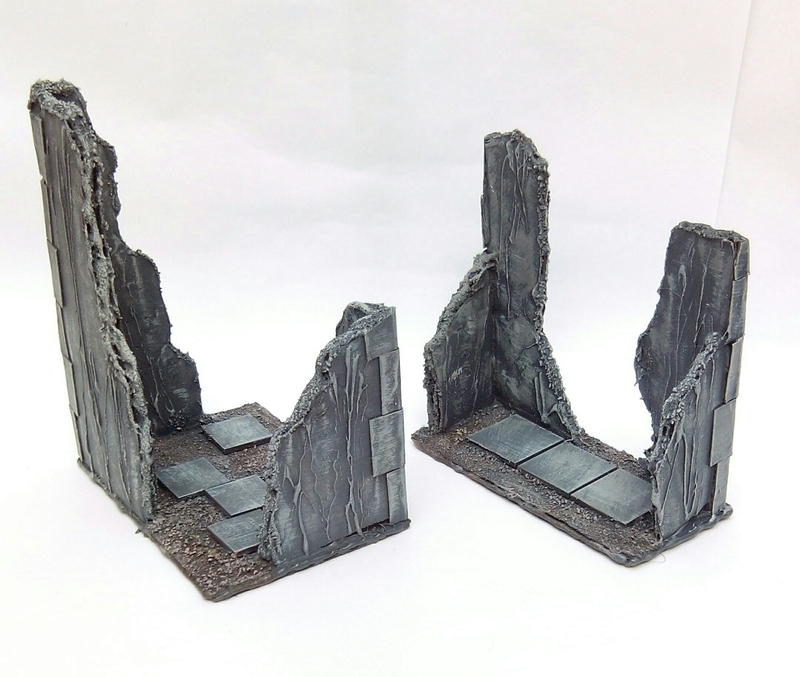 This is my cheap and cheerful way to rattle off some scenery. 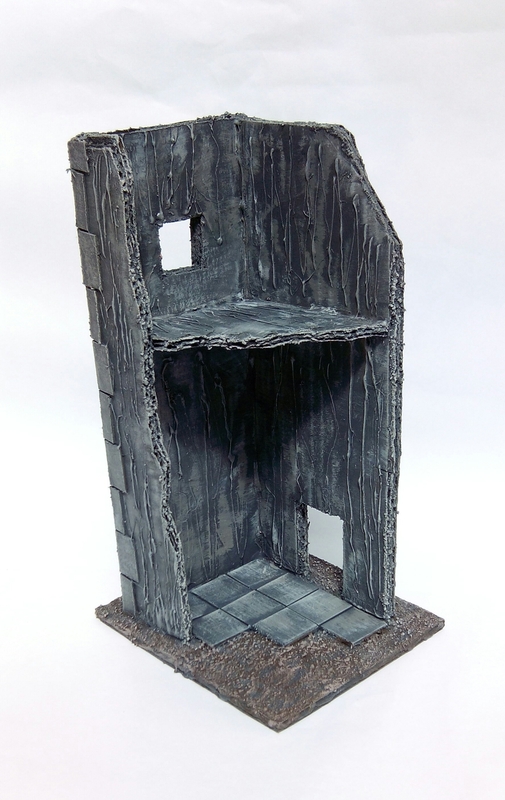 It was all painted with grey rattle can car paint primer as the base colour and then cheap pound store acrylic paints quickly brushed over the top – the entire lot was done in two days. 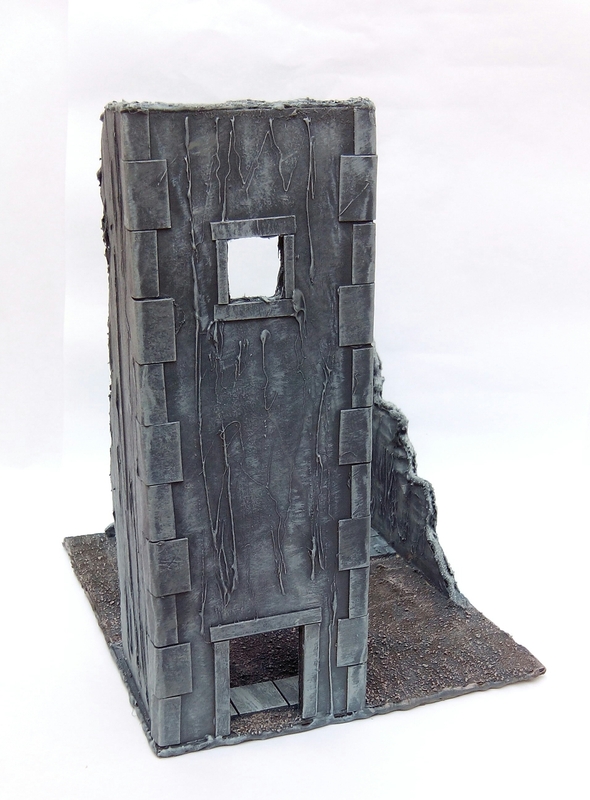 The walls for my ruins are just double thickness corrugated cardboard – two sheets glue gunned together. The cornerstones, window surrounds and doorways are cereal packet card glued on to give the illusion of masoned stone. I originally started making individual floor tiles but wasn’t happy with the time it was taking to cut them out or the overall look when finished. 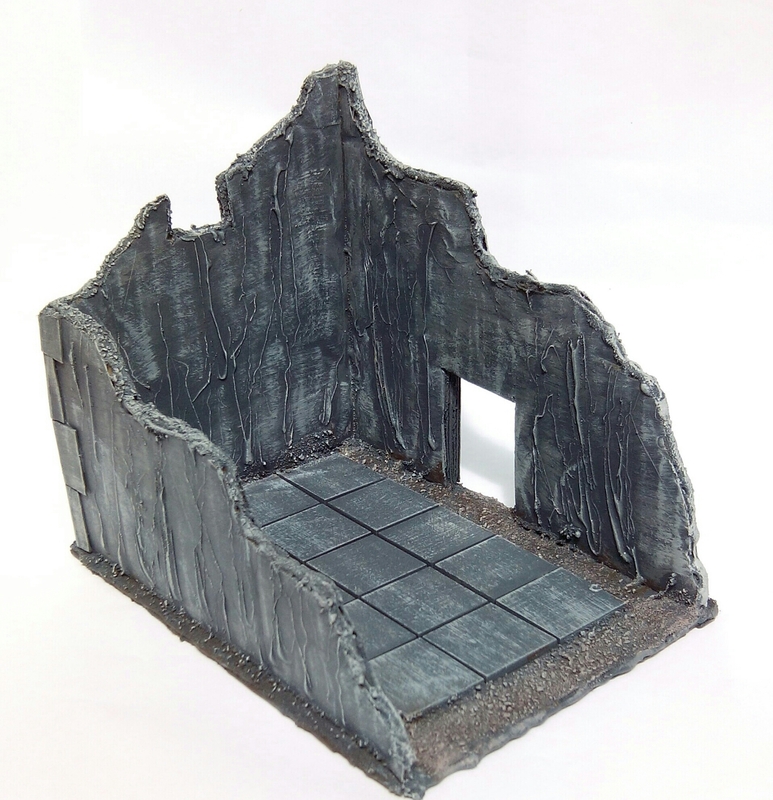 I changed to 20 & 25mm MDF miniature bases instead. Much quicker and more effective looking. The rubble was some really cheap fish tank gravel PVA’d in place – it had to be the cheap stuff because it’s all different sizes of stone, the pricier stuff is too uniform in size so not as visually effective. The texture on the walls is created by dragging the hot glue in streaks up and down the card. The edges have hot glue run along the tops and when cool repeated with PVA and sprinkled with sand/fine gravel to give a crumbling stone look to hide the corrugated edge. 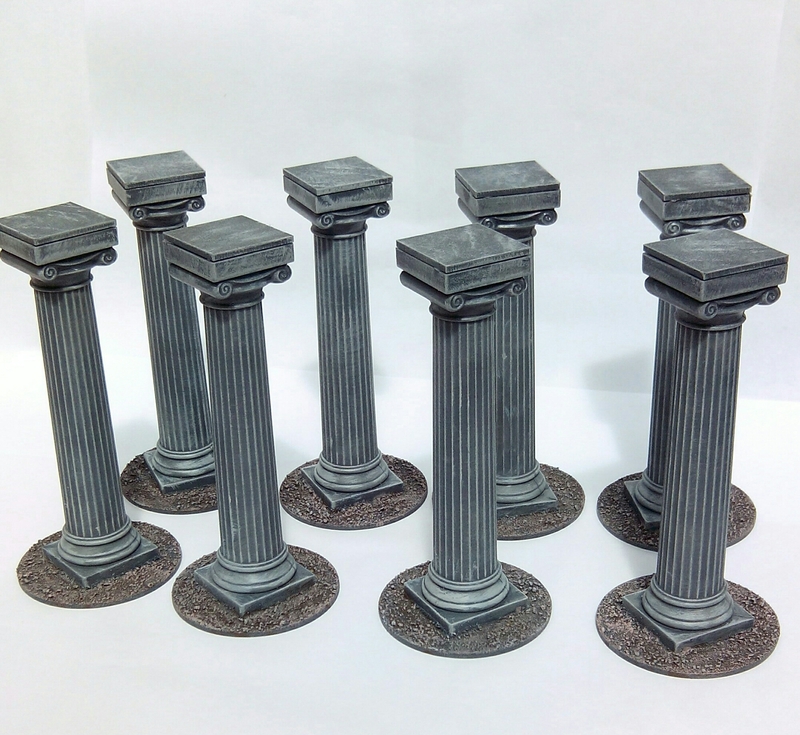 The pillars are of course cake making decorations and constitute the biggest cost to this project – £13 for 8. I based them individually for maximum usability – this way they can be circled or lined up in vistas and crescents rather than having them glued as say one static ‘rectangular temple’ for example. 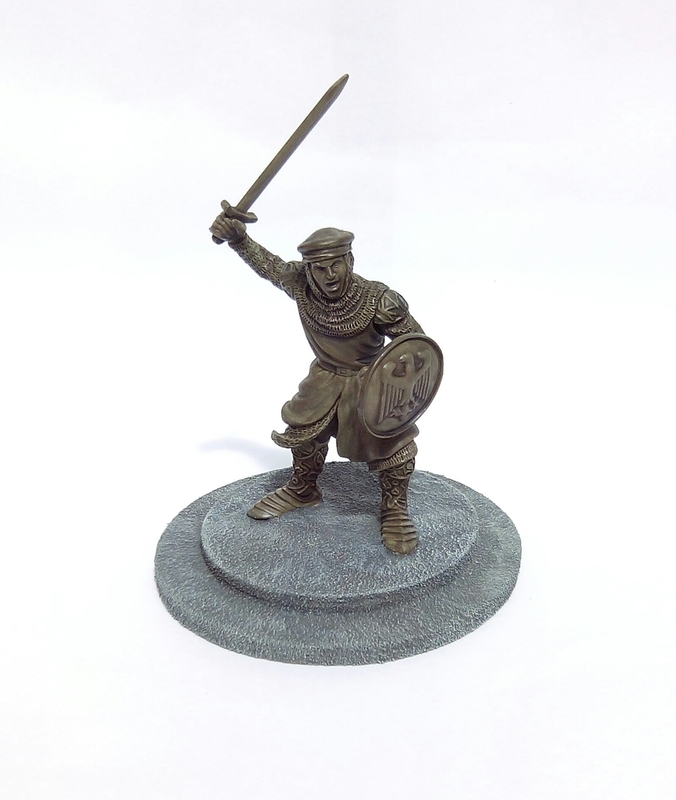 The bronze statue is this toy knight bought from a cheap store (Wilkos in the UK) for £2. He’s been based so that he could technically be moved around as an animated adversary should the need ever arise in a game. I also purposely avoided using any of the verdigris paint washes as I dont like any of the effects they create. So that’s technically enough Frostgrave scenery to run a few games at least. You may have noted there’s no snow/ice on any of these. I was tempted to cover everything with a layer of Woodland Scenics Snow effect (I’ve even got an industrial size tub of the stuff I’ve not even opened yet) however I wanted to extend the usage of these items so held back. 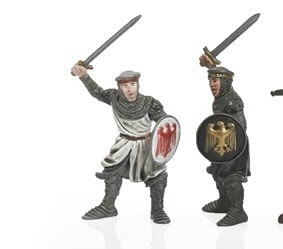 These items (minus the toy knight statue) could easily pass as WW2 Northern Europe or Dystopian near future ruins. 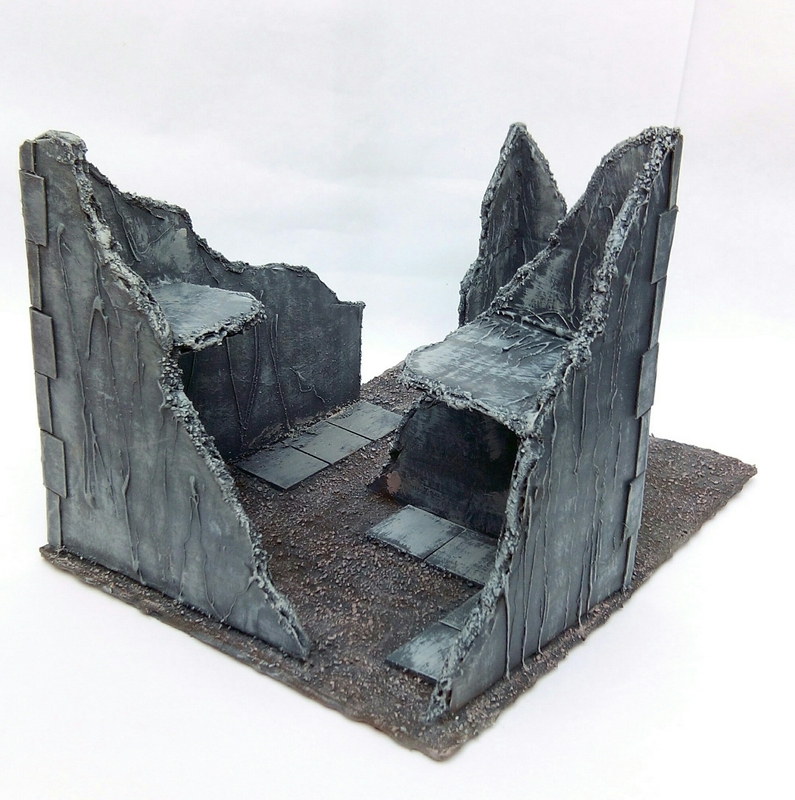 This entry was posted in Post-1990 and tagged Frostgrave, Ruins, Scenery, Scratch built on August 6, 2016 by Hobgoblin Orange.